1754: born in Edo. He is the third son of the actor and zamoto Ichimura Uzaemon VIII. 3rd lunar month of 1759: he makes his first stage appearance, at the Ichimuraza where he receives the name of Ichimura Kichigorô I and plays a child role in the drama in the drama "Hiru-ga-Kojima Buyû Mondô". 5th lunar month of 1760: his father Ichimura Uzaemon VIII dies. 8th lunar month of 1768: Kichigorô plays at the Ichimuraza the role of Prince Tokiyo in the drama "Sugawara Denju Tenarai Kagami". 11th lunar month of 1770: he becomes disciple of the actor Onoe Kikugorô I, who allows him to take the name of Bandô Hikosaburô III and to use his yagô Otowaya; The new Hikosaburô achieves a great success at the Ichimuraza by playing in the kaomise drama "Meoto Giku Izu no Kisewata", which welcomes in Edo the Kamigata star Arashi Sangorô II and celebrates also the shûmei of Bandô Sanpachi II and Segawa Kichiji III. 1st lunar month of 1772: Hikosaburô's rank in the Edo hyôbanki, wakashugata section, is jô-jô (superior - superior). 9th lunar month of 1773: Hikosaburô plays at the Ichimuraza the role of Ôboshi Rikiya in the drama "Kanadehon Chûshingura". The role of Rikiya's father Yuranosuke is played by Onoe Kikugorô I. 8th lunar month of 1774: Hikosaburô plays at the Ichimuraza the role of Ise no Saburô in "Yoshitsune Senbon Zakura". 8th lunar month of 1777: Hikosaburô plays at the Ichimuraza the roles of Ôboshi Mondo and Momonoi Wakasanosuke in the drama "Kanadehon Chûshingura". 3rd lunar month of 1781: Hikosaburô plays at the Moritaza the role of Ishidô Umanojô in the drama "Kanadehon Chûshingura". 1st lunar month of 1782: Hikosaburô plays at the Ichimuraza the role of Terukuni in the drama "Sugawara Denju Tenarai Kagami". Fall 1782: Hikosaburô and Ôtani Tokuji I go together to Kamigata. 12th lunar month of 1783: his master Onoe Kikugorô I dies. 1st lunar month of 1788: Hikosaburô's rank in the Edo hyôbanki, tachiyaku section, is jô-jô-(shiro)kichi (superior - superior - (white) excellent). 8th lunar month of 1790: Hikosaburô plays at the Ichimuraza the roles of Momonoi Wakasanosuke and Ishidô Umanojô in the drama "Kanadehon Chûshingura". 9th lunar month of 1790: the play "Yoshitsune Koshigoejô" is staged for the first time in Edo, at the Ichimuraza; it celebrates the onagori kyôgen of the Kamigata star Asao Tamejûrô I; Hikosaburô plays the role of Minamoto no Yoshitsune [more details]. 6th lunar month of 1791: Hikosaburô plays at the Ichimuraza the role of Minamoto no Yoshitsune in "Yoshitsune Senbon Zakura". 5th lunar month of 1793: Hikosaburô plays at the Ichimuraza the roles of Hayano Kanpei and Ishidô Umanojô in the drama "Kanadehon Chûshingura". The role of Okaru is played by Nakayama Tomisaburô I. 5th lunar month of 1794: Hikosaburô plays at the Kawarasakiza the role of Minamoto no Yoshitsune in the "Shi-no-Kiri" scene of the drama "Yoshitsune Senbon Zakura". 9th lunar month of 1794: Hikosaburô plays in the same theater the roles of En'ya Hangan and Kakogawa Honzô in the drama "Kanadehon Chûshingura"; the roles of Kô no Moronô and Yuranosuke are played by Ichikawa Ebizô. 10th lunar month of 1794: due to some financial difficulties, the salaries of all the actors are drastically reduced. Hikosaburô's yearly salary for the coming season is set to 520 ryô after a reduction of 40 ryô. 11th lunar month of 1794: Hikosaburô moves to the Miyakoza and plays the role of Godai Saburô in Namiki Gohei I's kaomise drama "Uruô Tosshi Meika no Homare", which celebrates the shûmei of Nakamura Nakazô II and welcomes in Edo the actors Kataoka Nizaemon VII and Nakamura Noshio II and the Ôsaka playwright Namiki Gohei I. 4th lunar month of 1795: Hikosaburô plays in the same theater the role of Ôboshi Yuranosuke in the drama "Kanadehon Chûshingura"; the roles of En'ya Hangan and Yuranosuke's wife Oishi are played by Sawamura Sôjûrô III and Segawa Kikunojô III. 11th lunar month of 1795: Hikosaburô plays the role of Kajiwara Genta Kagesue in the Miyakoza kaomise drama "Kaeribana Yuki no Yoshitsune". 7th lunar month of 1796: Hikosaburô plays at the Miyakoza the role of Kan Shôjô in the drama "Sugawara Denju Tenarai Kagami". 11th lunar month of 1796: Hikosaburô moves to the Kiriza and plays 3 roles in the kaomise drama "Ginsekai Matsu ni Yukihira". 9th lunar month of 1797: Hikosaburô plays at the Kiriza the roles of Kakuju and Takebe Genzô in the drama "Sugawara Denju Tenarai Kagami"; the roles of Kan Shôjô and Matsuômaru are played by Segawa Kikunojô III and Sawamura Sôjûrô III. 11th lunar month of 1797: Hikosaburô moves to the Nakamuraza and plays in the kaomise drama "Kaikei Kokyô no Nishikigi". 1st lunar month of 1798: Hikosaburô's rank in the Edo hyôbanki, tachiyaku section, is jô-jô-kichi (superior - superior - excellent). 4th lunar month of 1798: Hikosaburô plays at the Nakamuraza the role of Daihanji no Kiyosumi in the drama "Imoseyama Onna Teikin". 11th lunar month of 1798: Hikosaburô moves to the Moritaza and plays in the kaomise drama "Taiheiki Mitsugi no Funauta", which celebrates the shûmei of Ichikawa Aragorô I. 5th lunar month of 1799: Hikosaburô plays at the Moritaza the roles of Kan Shôjô and Takebe Genzô in the drama "Sugawara Denju Tenarai Kagami"; the roles of Matsuômaru and Kakuju are played by Ichikawa Danzô IV. 9th lunar month of 1799: Hikosaburô plays at the Moritaza the roles of Ôboshi Yuranosuke and Hayano Kanpei in the drama "Kanadehon Chûshingura". The role of Okaru is played by Nakamura Noshio II. 11th lunar month of 1799: Hikosaburô moves to the Ichimuraza and plays in the kaomise drama "Utsukushiki Yuki no Sekai", which celebrates the shûmei of Ogino Izaburô II. 2nd lunar month of 1800: Namiki Gohei's drama "Gosan no Kiri" is staged for the first time in Edo, at the Ichimuraza in a somewhat different version titled "Sanmon Gosan no Kiri" instead of "Kinmon Gosan no Kiri"; Hikosaburô plays the roles of Konomura Ôinosuke (in reality Sô Sokei) and Mashiba Hisayoshi [casting]. 7th lunar month of 1800: Hikosaburô plays at the Ichimuraza the roles of Ôboshi Yuranosuke and Hayano Kanpei in the drama "Kanadehon Chûshingura". The role of En'ya Hangan and Okaru are played by Ogino Izaburô II and Segawa Kikusaburô II. 11th lunar month of 1800: Hikosaburô moves to the reopening Kawarasakiza and plays in the kaomise drama "Modoribashi Tsuna-ga-Kaomise". 7th lunar month of 1801: Hikosaburô plays in the same theater the roles of Daihanji no Kiyosumi, Kamatari and Fujiwara Tankai in the drama "Imoseyama Onna Teikin". 9th lunar month of 1801: Hikosaburô plays at the Kawarasakiza the roles of En'ya Hangan, Kakogawa Honzô and Horibe Yajibê in the drama "Kanadehon Chûshingura". 11th lunar month of 1801: Hikosaburô moves to the Nakamuraza and plays several roles in the kaomise drama "Date Dôgutsui no Ôtori", which celebrates the shûmei of Bandô Hikozaemon I and Yamashita Mansaku. 3rd lunar month of 1802: Hikosaburô plays in the same theater the roles of Kan Shôjô, Shiratayû and Takebe Genzô in the drama "Sugawara Denju Tenarai Kagami". 6th lunar month of 1802: Hikosaburô plays in the same theater the roles of the yakko Ippei, Takemura Sadanoshin and Sanai in the drama "Koi Nyôbô Somewake Tazuna". 8th lunar month of 1802: Hikosaburô plays at the Nakamuraza the roles of Sasaki Tan'emon, Ishidome Busuke and Honda Dainaiki in the drama "Igagoe Norikake Gappa". 11th lunar month of 1802: Hikosaburô moves to the Kawarasakiza and plays the roles of Kawagoe Shigeyori, Tokaiya Ginpei, Taira no Tomomori, Taira no Koremori, Yokawa no Zenji Kakuhan, the fox Genkurô, Satô Shirobyôe Tadanobu and Minamoto no Yoritomo in the "Shi-no-Kiri" scene of the drama "Yoshitsune Senbon Zakura". 2nd lunar month of 1803: Hikosaburô plays in the same theater the roles of Shunkan and Fukuoka Mitsugi in the dramas "Hime Komatsu Ne-no-Hi no Asobi" and "Ise Ondo Koi no Netaba". Hikosaburô and Nakamura Daikichi I, who plan to go together to Kamigata, leave suddenly the Kawarasakiza, which has to close its doors up to the 8th lunar month because of the lack of stars in its troupe. 9th lunar month of 1803: Hikosaburô moves temporarily to the Ichimuraza and plays the role of Ôboshi Yuranosuke in the drama "Kanadehon Chûshingura". Fall 1803: Hikosaburô and Nakamura Daikichi I go to Ôsaka. 11th lunar month of 1803: Hikosaburô takes part in the kaomise drama "Sôzoku Ishibashiyama", which is staged at the Naka no Shibai and celebrates the shûmei of Asao Tamejûrô II. He also performs in duo with Nakamura Daikichi I in the shosagoto "Saiwai Narukana Iro no Yumitori". 12th lunar month of 1803: Hikosaburô plays at the Naka no Shibai the role of Kan Shôjô in the drama "Sugawara Denju Tenarai Kagami". 1st lunar month of 1804: Hikosaburô's rank in the Kamigata hyôbanki, tachiyaku section, is jô-jô-kichi (superior - superior - excellent). He plays at the Kitagawa no Shibai the role of Kan Shôjô in the drama "Sugawara Denju Tenarai Kagami". 6th lunar month of 1804: tour in Nagoya with Nakamura Daikichi I, Onoe Shinshichi II and Mimasu Daigorô III; Hikosaburô plays the role of Ôboshi Yuranosuke in the drama "Kanadehon Chûshingura", which is staged at the Miyawaka no Shibai. 11th lunar month of 1804: Hikosaburô plays at the Minamigawa no Shibai the role of Kan Shôjô in the drama "Sugawara Denju Tenarai Kagami". 12th lunar month of 1804: Hikosaburô plays the roles of the fox Genkurô and Satô Shirobyôe Tadanobu in the "Yoshinoyama" and "Shi-no-Kiri" scenes of the drama "Yoshitsune Senbon Zakura", which is staged in Ôsaka at the Horie Shibai. The roles of Yoshitsune and Shizuka Gozen are played by Seki Sanjûrô I and Nakamura Daikichi I. 1st lunar month of 1805: Hikosaburô's rank in the Kamigata hyôbanki, sôkanjiku section ("all kanjiku"), is shi-jô-jô-kichi (unique - superior - superior - excellent). 3rd lunar month of 1805: Hikosaburô plays the roles of the fox Genkurô and Satô Shirobyôe Tadanobu in the "Yoshinoyama" and "Shi-no-Kiri" scenes of the drama "Yoshitsune Senbon Zakura", which is produced by Yoshizawa Enjirô in Ôsaka at the Naka no Shibai. The roles of Yoshitsune and Shizuka Gozen are played by Arashi Sangorô III and Nakamura Daikichi I. Hikosaburô also plays the roles of Momonoi Wakasanosuke and Ôboshi Yuranosuke in "Kanadehon Chûshingura". 4th lunar month of 1805: Hikosaburô plays the roles of the fox Genkurô and Satô Shirobyôe Tadanobu in the drama "Yoshitsune Senbon Zakura", which is staged in Kyôto at the Minamigawa no Shibai. Hikosaburô also plays the role of Momonoi Wakasanosuke in "Kanadehon Chûshingura". 11th lunar month of 1805: Hikosaburô plays the roles of Tokaiya Ginpei and Taira no Tomomori in the "Tokaiya" and "Daimotsu no Ura" scenes of the drama "Yoshitsune Senbon Zakura", which is staged in Kyôto at the Minamigawa no Shibai. 12th lunar month of 1805: Hikosaburô plays the roles of Tokaiya Ginpei and Taira no Tomomori in the "Tokaiya" and "Daimotsu no Ura" scenes of the drama "Yoshitsune Senbon Zakura", which is produced by Yamashita Tokujirô in Ôsaka at the Naka no Shibai. 3rd lunar month of 1806: Hikosaburô plays at the Kado no Shibai the roles of Kanki and Fukuoka Mitsugi in the dramas "Kokusen'ya Gassen" and "Ise Ondo Koi no Netaba"; the roles of Watônai and Kinshôjo are played by Nakamura Utaemon III and Yoshizawa Iroha I. This is the last performance in Ôsaka for Hikosaburô, who plans to go back to Edo. He performs at the end of the program a great 7-roles hengemono called "Yuiyanagi Kumo no Ito Asobi". 4th lunar month of 1806: last performance in Kyôto; Hikosaburô plays the role of Ishioka Sazen in the drama "Akatsuki Garasu Gion Bayashi". He also performs at the end of the program the great 7-roles hengemono "Yuiyanagi Kumo no Ito Asobi". 11th lunar month of 1806: Hikosaburô is back in Edo and plays at the Ichimuraza the roles of Kajiwara Genta Kagesue, Okazaki Akushirô and Taira no Shigemori in the kaomise drama "Wakazakari Heike Monogatari". 1st lunar month of 1807: Hikosaburô's rank in the Edo hyôbanki, tachiyaku section, is shi-jô-jô-kichi (unique - superior - superior - excellent). 10th lunar month of 1807: Hikosaburô plays at the Ichimuraza the role of Matahei in the drama "Keisei Hangonkô". The role of Matahei's wife Otoku is played by Osagawa Tsuneyo II. 11th lunar month of 1807: Hikosaburô moves to the Nakamuraza and plays in the kaomise drama "Kaikei Yuki no Konoshita", which celebrates the shûmei of Segawa Senjo and Segawa Rokô IV. 1st lunar month of 1808: Hikosaburô plays in the same theater the roles of Daihanji no Kiyosumi, Soga no Iruka and Fujiwara Tankai in the drama "Imoseyama Onna Teikin". 5th lunar month of 1808: Hikosaburô plays in the same theater the role of Minamoto no Yoshitsune in "Yoshitsune Senbon Zakura". 7th lunar month of 1808: premiere at the Nakamuraza of Segawa Jokô II's drama "Zôho Izari no Adauchi"; Hikosaburô plays the role of Tsukumo Shinzaemon [casting]. 8th lunar month of 1808: Hikosaburô plays in the same theater the role of Kan Shôjô in the drama "Sugawara Denju Tenarai Kagami" [print]. 10th lunar month of 1808: premiere at the Nakamuraza of the drama "Kuruwa Bunshô"; Hikosaburô plays the role of Fujiya Izaemon [casting]. 11th lunar month of 1808: Hikosaburô moves to the Ichimuraza and plays in the kaomise drama "Irosoyuru Nidai Genji", which welcomes in Edo the Kamigata actor Sawamura Tanosuke II and celebrates the shûmei of Nakamura Rikô II. 1st lunar month of 1809: the Ichimuraza is destroyed by a fire. 4th lunar month of 1809: the theater is rebuilt and Hikosaburô plays the role of Kobayashi no Asahina in the drama "Reigen Soga no Kamigaki". 5th lunar month of 1809: Hikosaburô plays in the same theater the role of Futami Jûzaemon in the drama "Kameyama no Adauchi"; the performance is a big success. 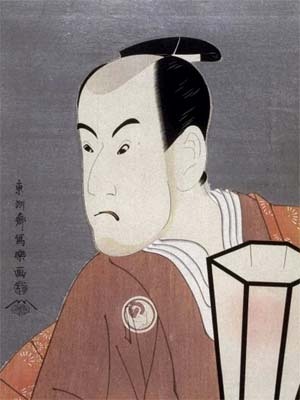 8th lunar month of 1809: Hikosaburô moves to the Moritaza and plays the roles of Minamoto no Yoshitsune and Yazaemon ("Sushiya") in "Yoshitsune Senbon Zakura". He also plays the role of Matahei in Chikamatsu Monzaemon's drama "Keisei Hangonkô"; the role of Otoku is played by Ichikawa Dannosuke III. 11th lunar month of 1809: Hikosaburô moves to the Nakamuraza and performs in the kaomise drama "Ôshû Dachiyuki no Kurogoma". 1st lunar month of 1810: Hikosaburô's rank in the Edo hyôbanki, tachiyaku section, is shin-jô-jô-kichi (truly - superior - superior - excellent). Hikosaburô plays in the same theater the role of Kudô Saemon Suketsune in the new year sogamono "Edo no Haru Gohiiki Soga"; the roles of Soga Gorô Tokimune and Soga Jûrô Sukenari are played by Ichikawa Omezô I and Sawamura Gennosuke I. 3rd lunar month of 1810: Hikosaburô plays at the Nakamuraza the role of Mashiba Hisayoshi in the drama "Sanmon Gosan no Kiri". The role of Ishikawa Goemon is played by Nakamura Utaemon III. 7th lunar month of 1811: Hikosaburô plays at the Nakamuraza the roles of Momonoi Wakasanosuke, Ôboshi Yuranosuke and Hayano Kanpei's mother in the drama "Kanadehon Chûshingura". The roles of En'ya Hangan, Okaru, Heiemon and Kanpei are played by Sawamura Gennosuke II, Sawamura Tanosuke II,Nakamura Utaemon III and Onoe Eizaburô I. Hikosaburô also plays the roles of Kan Shôjô and Shiratayû in the drama "Sugawara Denju Tenarai Kagami". 1st lunar month of 1812: Hikosaburô's rank in the Edo hyôbanki is goku-jô-jô-kichi (extreme - superior - superior - excellent). 11th lunar month of 1812: Hikosaburô goes to Ôsaka and plays the role of Sekihara Yoichi in the drama "Hirugaesu Nishiki no Tamoto", which is staged at the Naka no Shibai. He also plays the roles of En'ya Hangan and Kakogawa Honzô in the drama "Kanadehon Chûshingura". The role of Ôboshi Yuranosuke is played by Nakamura Utaemon III. 1st lunar month of 1813: Hikosaburô's rank in the Kamigata hyôbanki is goku-jô-jô-kichi (extreme - superior - superior - excellent). 9th ~ 10th lunar months of 1813: Hikosaburô plays for the last time (isse ichidai) the roles of Kan Shôjô, Takebe Genzô and Shiratayû in the drama "Sugawara Denju Tenarai Kagami", which is staged in Ôsaka at the Kado no Shibai. 11th lunar month of 1813: Hikosaburô appears on stage for the last time, at the Kitagawa no Shibai in Kyôto, playing the role of Ôboshi Yuranosuke in the classic "Kanadehon Chûshingura". 1813 ~ 1828: Hikosaburô retires and takes the tonsure in a Temple located in Kurodani (Kyôto). He goes back to Edo and lives a hermit life in a small hut called Hansôan and located in Mukôjima. Bandô Hikosaburô III was an outstanding tachiyaku and dancer, who excelled in wajitsu and budôgoto roles. He was one of the first actors to promote realism in Kabuki. Bandô Hikosaburô III's 2 best roles were Ôboshi Yuranosuke ("Kanadehon Chûshingura") and Kan Shôjô ("Sugawara Denju Tenarai Kagami").